The Model USMS2K depository safe is equipped with our UL Listed Guardian Double Nose Lock (dual control lock). This depository safe is ideal for a location that has space limitations and does not need separate compartments. Great for Quick and easy cash drops. 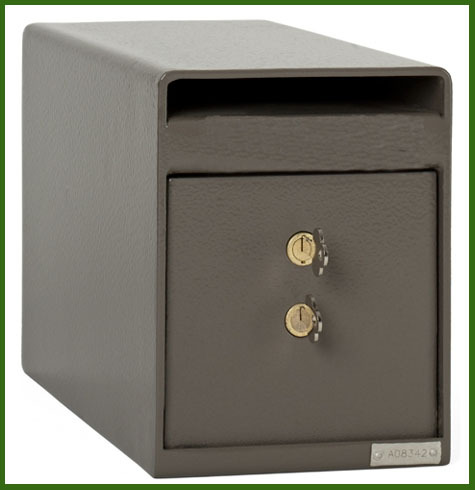 This safe is manufactured with a 1/4" steel body and a 1/2 inch steel door. Dimensions: 8" H x 6" W x 12" D; Weigh - 25 lbs. The Model USMS2K depository safe is equipped with a UL Listed Guardian Double Nose Lock (dual control). This depository safe is ideal for a location that has space limitations and does not need separate compartments.